He was voted Olympian of the century by "Sports Illustrated" magazine and there's a good reason why. Multiple Olympic gold medallist Carl Lewis is one of the most famous track and field athletes of all time. The American's professional career began in 1979, when he found success as a sprinter and long jumper at the University of Houston. Carl went on to win multiple medals, including ten Olympic medals - nine of which were gold - before retiring from all athletic competition in 1997. 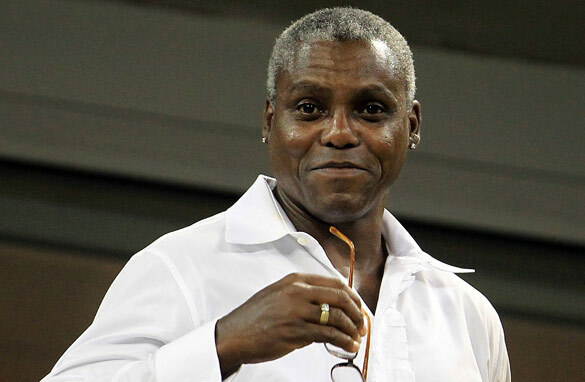 Since retirement, Carl has devoted a great deal of time to charity and set up the Carl Lewis Foundation. He is also pursuing another one of his passions - acting. Here's your chance to have your questions answered by this world-famous athlete. Please leave your questions for Carl Lewis below and be sure to include where you're writing from. What is your best advice for young kids on finding or rating success, whether it be out on the field, at school, in their worklife or when they are older and have families. What is a good way of looking at success. Performance enhancing drugs are obviously used throughout the sports world and there doesn't seem to be any solid long term solution. Should we just accept them and establish safe levels education etc or continue a "Zero Tolerance" stance? Thank you and you are the greatest! Mr. Lewis apart from being a great athlete could you talk about your charity work with Best Buddies and the Special Olympics. You truly are a role model for others . Many people know you but they really dont know all the good works that you do. That is the mark of a true of charity. You are truly one of my heros. According to many sources you have used doping substances throughout your career. How do you explain the documents that Dr Wade Exum revealed? What is your take on the professionalization of amateur athletics? What does the future hold for today's amateurs? Is there any difference in what you see today vs. the 80's and 90's? I was a teenager in the late 80's/early 90's and having been a sprinter myself at that time in school it was always a rush of adrenalin to watch you sprint in competitions. These days after decades of scandals and everyone assuming everyone is using some sort of performance enhancing drug, do you honestly believe a human can run under 10 seconds without some sort of assistance? By assistance I am not referring to proper sleep, proper diet, hard training....I am referring to something that is administered to enhance the bodies natural way of functioning. What is your advise to those Olympians who have recently retired from sport and are trying to figure out their next step? Greetings Carl, life goes on and a lot of things happen along the way. I always admired the focus that you brought to your craft. I always thought that the reason that you were a cut above the rest is that you truly believed in the process/mechanics or sprinting, and you were going to raise the bar by being better at execution than anyone else. And you extended your career by holding your form in the last 40 yards better than anyone then, or since. So, what are you doing for athletic endeavors now? I know that it's hard to reach back to the level of excellence/work that you had to go through before, but what do you do now to stay fit? Once an athlete, always an athlete. You have had so many athletic achievements throughout your career– does one stand out in particular? You were drafted by the NBA team Chicago Bulls back in 1984, the same year Michael Jordan was. Did you ever seriously consider playing beside him? Did you think you had enough basketball talents good enough for the NBA? How about being the wide receiver for the Dallas Cowboys? What are your thoughts about these honorary drafts? What is your opinion of Usain Bolts? How do you see yourself matching up to him or vice versa? What is your advice to him? What is the ideal drug cocktail to use when getting ready for a career in sprinting? thanks! I've always found your primping, vanity and finger pointing insufferable, as it inevitably trivialized your extraordinary accomplishments on the track. My question is, will you bring the same staggering lack of self awareness to acting, as you did to athletics ? You have hinted that the Jamaicans are possibly using PEDs. Have you ever visted Jamaica during the National Championships and other meets to have a look at our track programme? Everyone who has been are amazed at how much focus we put on track. This is an open invitation to visit and see for yourself before you criticize. I'd like to ask him the following: what does he think about the future of US Track & Field. Could athletes like Lolo Jones, Allyson Felix, Rudy Gay, etc achieve the same notoriety that he and others like FloJo, Jackie Joyner-Kersey, etc, achieve in the 80's & 90's? Or will their success be forever tainted by PED's, the Marion Jones scandal, etc? Which steroid was your supplement of choice. why did US track association keep your positive tests quiet. –	How will the Carl Lewis Foundation Improve our world? I am awaiting Carl Lewis’ replies. Hi Carl, are you aiming on singing the National Anthem at the Superbowl again in the near-future?. The last time brought tears to my eyes. You have had a long and successful career in Track and Field. Many of your peers have fallen by the wayside because of doping problems. Many have said (as in Cycling) that the drugs were necessary to compete at the highest levels and that virtually every top athlete used them. Your record speaks for itself about whether you have been caught using performance enhancing drugs. However, can you sincerely look at your admirers and say that you are perhaps the only top Track and Field athlete with a career as long as you have had, to have never used drugs (or growth hormones, etc etc) to enhance their performance? Never .... not once?? I read a wonderful story about you and spiritual leader Sri Chinmoy who was also a strength champion.You were actively training for the 1996 Olympics in Atlanta, and Sri Chinmoy called you. He saw that there could be a serious problem and asked you to pray for protection for a few minutes each hour. You did it...and then during competition it was widely reported that a 16 pound steel hammer just missed hitting you by a few feet. You were very grateful not to be hit. Can you tell us more about this incredible experience and how Sri Chinmoy helped guide you. Hi Carl! You have been a hero and role model for me ever since I ran track and field in college..and especially your ability to concentrate so powerfully just before all your races. Everyone else would be moving around here or there...but it seems you were doing something very special...as you were totally quiet and meditative. Can you tell more about this? Is it connected to some of the stories in your autobiography Inside Track? My friends and I have been long-time admirers of yours. Because of your stellar athletic accomplishments and your self-giving work with charities and with your Carl Lewis Foundation, you have been an inspiration to millions of athletes and track and field fans as well. My question is: What does Carl Lewis most want his legacy to the world to be? You seem always to be enthusiastic. Please tell us about the non-running, more contemplative side of your life that keeps you so "up". We have heard Christianity, Sri Chinmoy, religion, spirituality mentioned in connection with you. It would be nice to hear that part of your story. Carl, I know Sri Chinmoy was a great positive influence in your life for years. Would you please describe how he encouraged you spiritually to bring out the best in yourself? I am one of your greatest fans in Switzerland and I know that there ten thousands here. We will never forget your great races in Zurich, like in 1988 when you ran your first 100 m world-record. Hopefully you come back some day. On June 19th we are holding our 16th Swiss Masters Games in track & field – any chance to have you at the 100 m starting line? I admire you as a person and your great work! By looking at your activities and what matters to you, you have made choices that show me that Spirituality is deeply rooted in yourself. I would like to ask you how have you been successful in balancing all the success that you have had, which many people easily lose control of, and your Spiritual Live. Did Meditating under Sri Chinmoy's Teachings help you achieve your spiritual fulfillment? Can you tell me what was it like to learn directly from Him? Please keep working in all your endeavors! I did a book report on you because I think you're a great person.I wanted to ask you what impact did your accomplishment have on the community,country, or world ?